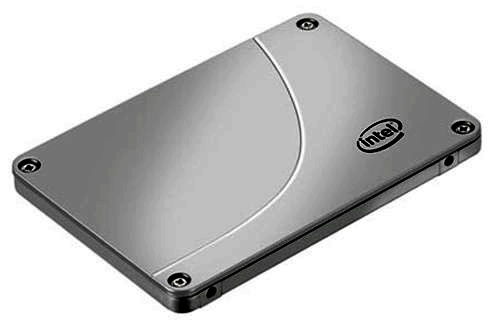 Intel has a new budget 330-series solid-state drive (SSD) coming on Friday, 13 April, according to Amazon and other online bazaars, and it almost doubles the current 320 SSD's performance. Amazon UK lists the 120GB 2.5-inch Intel 330 SSD for £109.05. A Google search on its part number, SSDSC2CT120A3K5, will find dozens of mentions of the device. Web store sabrepc.com has fallen over but before its server imploded, the site listed the flash device as a third-generation multi-level cell drive capable of SATA3, with a 60GB box costing $89, 120GB costing $149 and 180GB at $234. Our understanding is that the 330 series are the Maple Crest SSDs and use Intel-Micron's 25nm process, 2-bit MLC NAND. They clock up to 500MB/sec sequential reads and 450MB/sec sequential writes. No random read and write IOPS numbers are available. Intel's current 320 series, also using 25nm MLC NAND, does 270MB/sec sequential reads and 220MB/sec sequential writes, so we're looking at an approximate doubling in streaming I/O performance. They come in 40, 80, 120, 160, 300 and 600GB capacity points, way past the 180GB 330 maximum. But we do have Intel Jay Crest and Oak Crest 300-series SSDs coming in the fourth quarter of this year. They could be implemented in 20nm NAND and so provide headroom for higher capacities. The 320s do up to 39,500 random read IOPS and 23,000 random write IOPS; a pretty poor showing, really. We might expect the 330 to reach the 50,000 and 40,000 read and write IOPS levels and perhaps go beyond.